The machine shown left is a Stihl TS360. As you can see the air filter and throttle handle have swapped places from the TS350, but that isn’t the limit of the changes. The TS360 also boasts a slightly larger capacity engine than the early TS350 and you can see that this model is fitted with a water system with standard hose fitting, cool blades last longer and cut better. The water system dramatically reduces dust too making this machine easier to use for the operator, although if you’re expecting an anti-vibration system then you’re out of luck with the TS360, that’s an innovation meant for later machines. 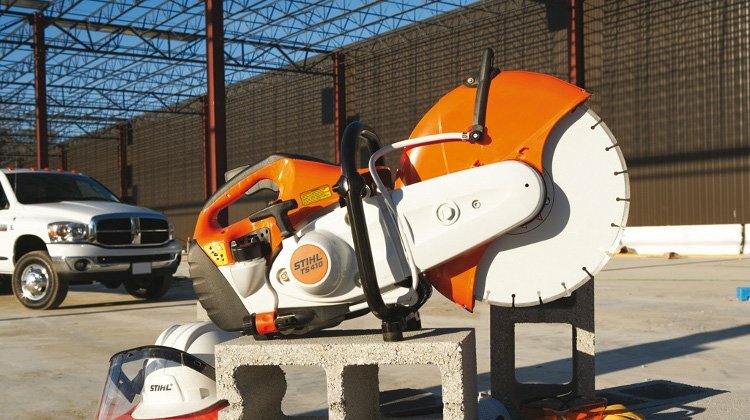 You can follow the same maintenance tips for the Stihl TS360 as the TS350.